Can this Film Stop the Bullying Problem? It happened when I was in fifth grade. Our class had a substitute teacher one day, and we spent the last hour outside. Many of us played kickball. But when the game started to get stale, the “cool kids” took the ball and started doing their own thing. I wanted to play with them, so I tried to get in their game. However, instead of welcoming me, they started calling me names and throwing the ball at me, hitting me with it multiple times in the head, chest, and back. I tolerated it for a while, but then decided I’d had enough. Upset and near tears, I went inside without telling anyone. The substitute was so oblivious she didn’t even see me go. Somehow, I held it together on the bus, and when I finally got home, I made a bee-line up to my bedroom, where I broke down and cried. For most of my childhood, I’d been on the receiving end of bullying. From incessant name-calling to being pushed around and excluded from activities, I was pretty much your stereotypical suburban bullying victim. And like most bullying victims, I’d gotten used to it, as if that was my lot in life and there wasn’t a whole lot I could do about it. My parents didn’t know much about how I was being treated (I generally kept it to myself), and the teachers at school were doing very little to stop it. In fact, their coddling of me probably made it worse since I was seen as a teacher’s pet. So that day in fifth grade was a real breaking point for me. I told my parents what had happened, and they asked a lot of questions. Why? How? Didn’t anyone do anything? What were you doing? I didn’t really want to answer these questions, so they didn’t exactly make it easier for me, or make me want to tell my parents again. I don’t recall any specific action being taken after that day, but I have to believe something did happen because I don’t have any memories of things being quite so bad ever again. In fact, by the end of middle school (around the time of my 13th birthday, to be specific), I’d found some confidence and strength, and things got much better for me. But I never would forget those earlier days of being bullied, and how awful it felt. And even now, that one day in particular still stands out. So you can probably imagine the visceral reaction I had while watching the new documentary Bully. A sympathetic portrait of five young children, all of whom are victims of bullies, Bully presents an unflinching look at just how tough going to school can be for someone who is different. One of the kids, Kelby, was a star athlete who came out as a lesbian and then lost nearly all her friends — including those on her basketball and softball teams. She tells the story early in the film of being hit (literally, almost run over) by a van full of high school boys. Despite this, and her parents’ offer to leave town and start over somewhere else, 16-year-old Kelby remains a strong, gutsy teenager, hopeful that one person can change an entire town’s minds about gay people. Then there’s Ja’Meya, the 14-year-old who one day decided to stand up to her bullies by bringing her mother’s loaded handgun into school. While she never shot anyone, Ja’Meya’s threats with it landed her in a juvenile detention facility. Like so many others in his situation, Alex is in denial that he’s a bullying victim; he tells his parents the kids are just “messing with” him. Of course, Alex, Ja’Meya, and Kelby are the “lucky” ones. Bully also tells the story of Tyler Long and Ty Smalley, two young boys who took their own lives rather than continue to be abused by their classmates. The two boys’ parents are still smarting from the loss. 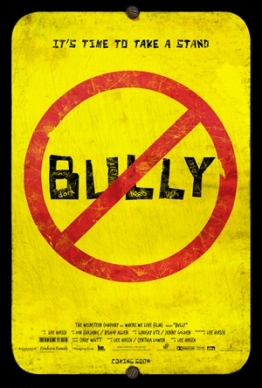 No, Bully is not an easy film to watch. Bring tissues. I can’t say things ever got as bad for me as they did for these kids, but damn if I couldn’t identify with their plight. I watched much of Bully with tears in my eyes. And yet, as challenging as these stories are to watch, what’s equally frustrating about Bully is the lack of understanding or solutions presented. We also never see much in the way of change. Tyler and Ty’s parents both get involved in a grassroots campaign to raise awareness, but most of the teachers, school administrators, and parents seem utterly clueless about what to do to stop the kids from being so cruel to one another. Yes, the film is part of a larger campaign to stop bullying, but there’s no evidence on screen that bullying actually can be stopped, or a hopeful message that things will get better. Instead, director Lee Hirsch’s film shows us just how bad the problem of bullying is, how helpless the kids are when they’re being bullied, and the audience is left to do something about it. That’s not to say there are any answers. For years, parents and school administrators have struggled to explain and prevent bullying. That it’s a chronic problem that repeats itself and only seems to be getting worse — it’s estimated that 13 million children are expected to be bullying victims this year — makes it even more frustrating. As the principal of Alex’s school says, kids will be kids. There’s not much that can be done to stop this behavior. And as someone who’s been there, I’m unfortunately inclined to agree with that sentiment. But I’d rather be wrong. And maybe Bully will be a film that will lead to fewer children who are different being treated like victims in the future. That will happen if people see the film and open their eyes to how serious this problem is. Bully is a moving portrait that’s heartbreaking and sad, but shouldn’t be avoided. It’s a must-see. I’m giving Bully a B+. Have you seen this film, or will you? Share your thoughts in the comments section below. Excellent post, Martin. Generous and brave of you to share your bullying experiences. I will see this movie even though a big part of me doesn’t want to. Thanks, Stephani! Glad you liked it.